Framed portraits: The Portrait is a vibrant satin fabric image. The images is wrapped over a foam core board and framed with a 2 ¼ inch frame that comes in 4 colors. Do the funeral portraits come overnight with shipping included? YES. All our products include overnight shipping. How large are the frames? The frames are large at 2 ¼ inches. Hence the frame adds 4 ½ inches to the size of the funeral portrait. The frames are also tastefully ornate and thick. They are impressive. How do the portraits look? The funeral portraits look professional. They are not just a piece of paper behind a frame. They are mounted on a foam core backing that makes the image look professional and long-lasting. Our portraits are the same high definition material we use in the cap panels. The image is stunning. Do we have design choices for backgrounds with Portraits? YES All the designs available for Cap Panels and Tribute Blankets are also available for portraits. This allows you to have a themed service. 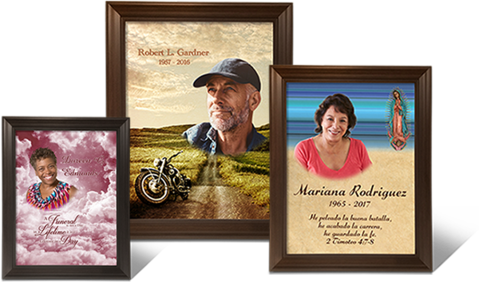 What are my frame choices for Funeral Portraits? There are four choices of frames, black, silver, wood and gold. The frames are large and wide at 2 ¼ inches. All portraits come with frames. We do not ship portraits without frames. .